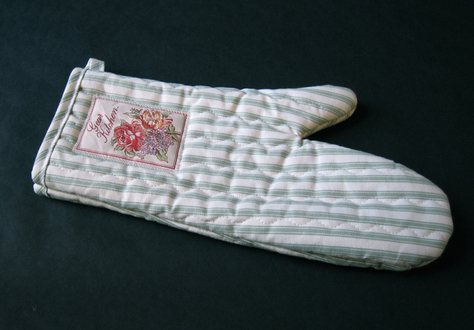 Quilted cotton oven mitt designed by the home furnishings innovator Raymond Waites, whose high-quality Gear line was one of the most fashionable and successful decor brands for nearly 20 years. Cream-white cotton ground printed with celadon green ticking stripe and appliqued near the cuff with a floral patch labeled "Gear Kitchen." Features loop for hanging. Handsome accent for the kitchen. Never used. Very slight age spotting.